Hanoi (VNA) – The Prime Minister on April 5 issued Decision No. 558/QD-TTg on criteria for new-style rural districts in the 2016-2020 period, as well as regulations on the recognition of provincial towns and cities that have met the standards. Aside from setting out new criteria for new-style rural districts, the decision says that in order for a district to be recognised under the designation, all communes must meet rural development standards. The district must also fulfill nine criteria under the programme, namely planning, transportation, irrigation, electricity, health care-culture-education, production, environment, security-social order, and new rural building instructions. Meanwhile, a provincial town or city must have all communes fulfill 19 criteria in order to receive the designation. The national set of criteria regulated in Decision No. 491/QD-TTg, issued in April 2009, are applied to districts that have been under consideration to be recognised as new-style rural areas from 2010 to 2015. The National Target Programme on New Rural Development, launched in 2010, set out 19 criteria for new-style rural areas covering infrastructure, production, living standards, income, culture and others. A district must have at least 75 percent of its communes meeting all 19 criteria in order to receive the title of new-style rural district. As of February, as many as 1,761 communes across the nation had met the new-style rural area criteria, accounting for 19.7 percent. On average, each commune met 12.9 criteria, up 8.2 criteria from 2010, and 2.9 criteria from 2015. 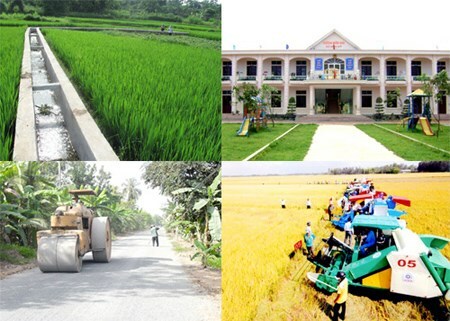 Meanwhile, 17 districts obtained the status, according to the Central Coordination Office on New Rural Development.